AN 85% VICTORY – BY THE NUMBERS! Numbers aren’t the whole story, but the numbers alone tell quite a tale. While the 85% margin of victory is impressive, so are the small print numbers. The percentage of Altadena voters who actually showed up at the polls was 38%, a dismal number by most standards, but far better than the 31% of voters who cast a ballot in California, and vastly superior to the little more than 25% of Los Angelenos who bothered to show up. However, we anticipated the low turnout, and made countering it a cornerstone of our plan. This “Yes on A” election had more than its fair share of liabilities: First, it was a vote for a parcel tax, in a struggling economy, and it needed a minimum of a 2/3 majority to pass. Then there was a pesky awareness problem – according to Library research, over 60% of Altadenans, 16,522, did not know that this was their own library district, or that the tax already existed. 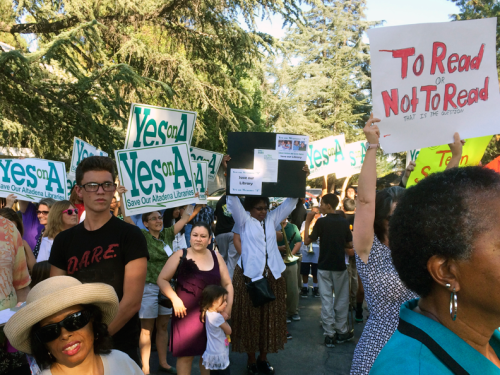 No surprise there, the majority of new Altadena residents had moved in after the last vote a decade ago. In fact the origin of the tax was way back in 1994. Parcel tax support began with a bang. 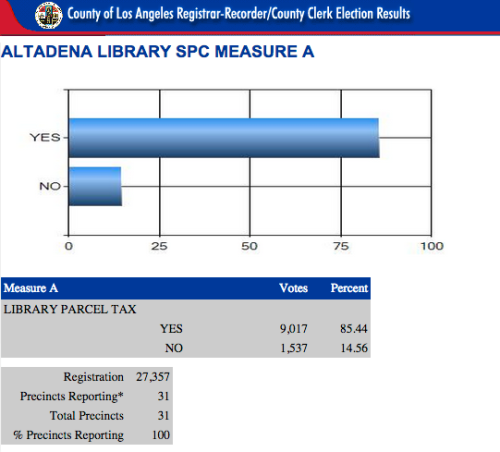 To make up for drastic library funding cuts in 1994, Altadena voters rose up and overwhelmingly adopted this tax, on their own properties, to keep the district going, by a then…”unheard of” 85%. Altadena voted two more times to continue that support for their Libraries in 1999 by 80% and in the heady economic times of 2004 by a mere 77%. That last renewal was for ten years; it was about to expire… and the downward trend was discouraging. Especially considering the recession. But our marketing team chose to concentrate instead on our remarkable assets. At least 80% of the community, over 22,000 residents, had used the Altadena Libraries in the previous year. They were all potential advocates and activists. They may not have known who actually owned the libraries, but reaching that audience was not a huge stretch. So we decided to reach for even more. That unsettling 60% majority who were unaware that these libraries were actually Altadena’s own, were connected, later Boomers and even younger Gen X-ers. They were a prime audience for Website messaging, opt-in email, on-line PR, Facebook, Twitter and social media in general. And those were the ideal media to generate engagement and excitement. Also on the plus side, we had 10 months to get our message out, so we had the luxury of splitting our message into two parts. Education first and then advocacy. First came educating and exciting the community, “This is our library,” was our primary phase one message. Our secondary message: libraries have changed. They have evolved into vital community centers. 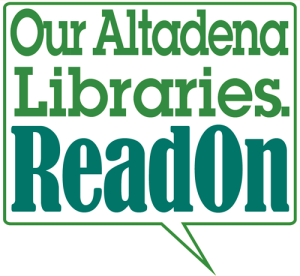 Finally we needed to tell the story of what is going on at “our Altadena Libraries.” To do all that we needed a compelling all-encompassing theme that not only informed but moved our audience. We chose: READ ON! It was empowering, memorable and could frame a multitude of meanings. Foremost among these of course was “read.” Continue to read. Make reading a part of your lives. It’s the core reason for libraries’ existence. But “Look what’s new” is also implicit, as is “Just you wait” and within the “Read One” headline element, we could insert events, improvements and measures that were of importance to the library and to our Altadena neighbors. We created our website, Facebook page, merchant window posters, lawn signs, online PR releases and ID suite around this identity. Within a few months, The Altadena Alliance had gone from 0 recognition to hundreds of followers, and our volunteer numbers began to swell. We concentrated almost exclusively on enhancing library awareness and perceived value. In September, the time came to actively promote our message to vote for the parcel tax, and we kicked it off with a number of events promoted mainly through our social media and online PR. The results exceeded our expectations. With the help of our campaign, Judy Hermisso, our volunteer coordinator, brought in hundreds of volunteers, advocates, students, parents and activists who would be critical to our victory. As an added bonus, all of our online promotion for our events succeeded in almost doubling our online visitors, which greatly enhanced the authority of our online presence. The number of attendees at our Library Rally attracted the attention of news organizations from surrounding communities including the Pasadena Weekly and Pasadena Star News. The day of the September library rally, phase two of our campaign began. Our message changed from “READ ON!” to “YES on A!” That message immediately appeared on our website, new lawn signs, posters, social media and online PR. The URL, Facebook address and email graphic and verbal vocabulary remained the same. So on its very first day, our new “Yes on Measure A” message began its life with hundreds of active supporters and significant momentum. By the time the official California Voter Pamphlet was printed, there was no opposing argument. By Election Day, it was clear that support for the Library District was overwhelming. Still no one in the Altadena Library community anticipated this kind of response. Their political consultant was adamant that they could not count on any more than “5-6,000 voters” from “4,000+ households” and that would be sufficient. Instead we garnered more than 9000 yes votes. At the core of our victory was putting the right messages, in front of the right audience, at the right times. The numbers don’t lie.